The winner is Suburb Sierra! Ten lords a-leaping shiny sparkly pendants to choose from! Courtesy of Things Remembered, for this giveaway you can win a piece from their Custom Couture Jewelry Collection! First choose a bracelet or necklace in one of five designs, including a pearl or beaded chain or bracelet. Then add one of three engravable pendants and finish the accessory with a miniature, sparkling birthstone pendant, initial pendant with pearl accent, and/or one of six miniature charms, including a star, angel, cross, heart, butterfly or key. How fun! Isn't it purty? 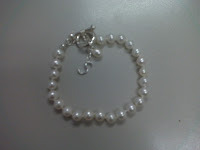 I chose the pearl bracelet with a miniature "S" initial pendant. I also got the silver circle engraveable pendant, but am trying to think of something special to have engraved on it. "Mom" seems too boring. "Rockstar", perhaps? Heh. Remember to follow Things Remembered on Twitter and become a fan on Facebook! To win: Simply leave a comment below telling me what items you would choose to create your custom jewelry piece. No e-mail? No blog? Then how will I get in touch with you? I must be able to click on your comment name and be directed to a website or I must be able to see your e-mail address in your comment. Otherwise be sure you leave your e-mail address in your comment. I LOVE the heart cluster bracelet. Love it! I would go with the pearl bracelet with the butterfly charm and my initial which is a K.
The pearl necklace with the charm. So cute. Love them! I would choose the silver bracelet with January charm engraved w/SLS with star charm! Hmmm...it is hard to choose. There are so many choices! I would probably choose a Necklace w/ round engraveable charm, and then add the small initial 'H', a star accent & a July birthstone accent. I would get the sterling silver necklace with my birthstone, initial, and the cross. These are beautiful. as for mine - i want mine just like yours only with the letter L for my lovebug. I'm not a big fan of pearls, so I'd go with the sterling silver bracelet instead. Woohoo! I'd love the Custom Sterling Silver Bracelets with Free Keepsake Box - it's stunning. I would choose the silver bracelet with a J and a butterfly. They are beautiful. Thank you for sharing this site. I am headed back to shop for my neices. Oooh what a great giveaway and a really tough choice to choose my favorite! I narrowed it down to either the pearl necklace or the 36 inch sterling silver necklace. With a heart pendant and an "S" charm. I will be hitting the Mall tonight and will have to jump into Things Remembered to check them out! Nice. I'd pick the pearl bracelet and the A initial and Star. My two kids are stars in my eyes and both have names starting with A.
I'd pick the sterling sliver bracelet with a january stone and the letter A. Thanks! what a nice prize...you never cease to amaze me. I would get the silver necklace (the lighter one) with a round charm and my birthstone (august) pendant. yum! I'd probably do the sterling silver bracelet with initials! I woudl like the silver bracelet with a "K" charm. These are really pretty! oh, how pretty! i love pearls. I think I'd do the pearl bracelet with an initial charm for each of my kiddos. Very pretty! I love the Sterling Heart Dangle Bracelet. I would love to engrave it and give it to my sister.